DEERPARK—Workers on the Deerpark Democrats’ campaign report an estimated 60 percent of the signs they put up before the election going missing the night of Nov. 2, the night before today’s election. This has been a pattern throughout the Democrats’ campaign, but it dramatically increased in the lead up to the election. One campaign worker, Nick Verashaka, estimated that 60 percent of the Democrats’ signs had gone missing. Verashaka reported that a big wooden sign was defaced on his property on Oct. 24, either during the night or in the early morning. He said whoever did it must have come about 50-60 feet onto his property because he found a rock the size of a basketball that had been taken from top of his driveway near his house, sitting near the defaced sign at the bottom of his driveway. What comes out is fear mongering and divisive behavior that will linger long after. He said when he first moved to Deerpark he thought it was a very friendly community, but he has since moved his tools inside and keeps his front light on. “It was like ‘Wow, do I have to worry for my safety? '” he said. He reported that another large wooden sign on the corner of 211 and Galley Hill Road, which is also on private property, was ripped out of the ground. He said it looked like someone had attached chains to it and ripped it out with a vehicle, probably a truck judging by the power required to take it out. In addition, he said it was ripped to shreds, “and they only have one post because the other post was completely destroyed,” Verashaka said. Possibly the most blatant was the large wooden sign right across from the police station on 209 in Huguenot that looked like it had been run into with a vehicle. Deerpark Sergeant Liz Sullivan said the security cameras at the police station only cover the parking lot and would not have captured the vandalism. She also said no one had reported the incident. 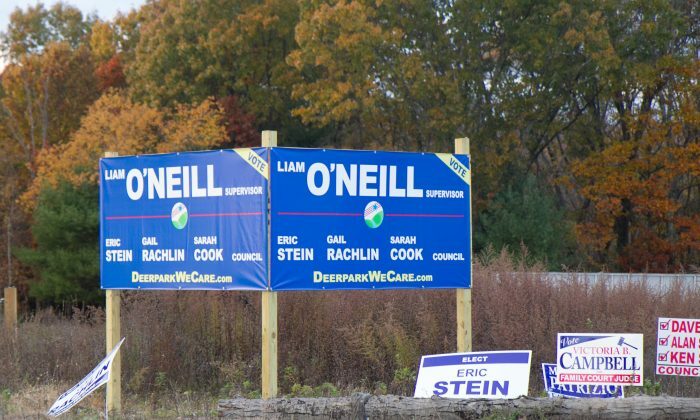 Democratic supervisor candidate, Liam O’Neill, reported to the police an estimated $2,500 worth of signs going missing as of Oct. 21. He said he wasn’t optimistic it would be investigated, however, as his opponent, incumbent supervisor Gary Spears, is the police commissioner.